Not minutes after visiting Mary Chocolatier and walking away with a bag full of chocolates for ourselves and to bring home as gifts, we wandered to another nearby mall in Brussels to check out yet another chocolate shop whose reputation landed it on the list of the 10 chocolate shops in the world worth going out of your way to visit. Funny thing is, recently, I was at Union Station in Washington, D.C. and ran into another branch of this particular chocolate shop. I knew they had locations worldwide, I guess I didn’t need to go all the way to Brussels to find them. A true Belgian classic, Neuhaus chocolates is the creation of Jan Neuhaus who opened a pharmacy at the prestigious Galerie de la Reine in 1857. In order to make his medicines more appealing to his clients, he coated his medicines in a layer of chocolate. Over 50 years later, Jan Neuhaus Jr., grandson of Jan Neuhaus, decided to take his grandfather’s idea a step further by replacing all of the medicine “filling” inside the chocolate with fresh cream instead. This became the first filled chocolate candy, which he dubbed a “praline” and therefore inventing the world’s first praline. In more than 150 years in existence, Neuhaus today still uses some of the same recipes it used to make its famous chocolate bonbons including the “Bonbon 13” and “Astrid” along with their other signature chocolates, “Baudouin,” ” Fabiola,” “Albert,” and “Paola,” in honor of two different royal Belgian weddings in the 1959 and 1960. The store we visited was a small retail store instead of a bustling mall. 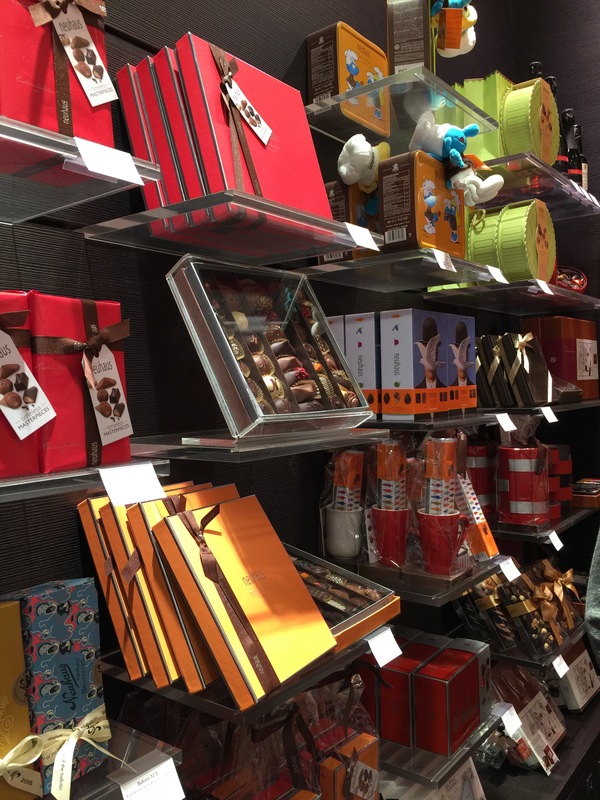 The store was mainly selling boxes of pre-packaged chocolate bon bons and bars, gift packages that you could easily pick up for any occasion. 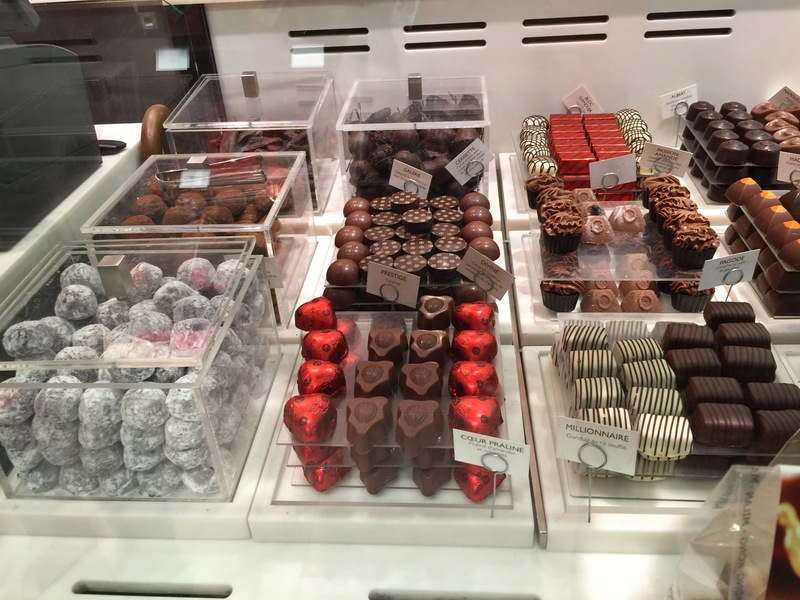 But pre-packaged boxes weren’t what my husband and I were interested in picking up at Neuhaus. We wanted some fresh chocolate bon bons that we choose ourselves to make a box out of, much like we had previously done at Pierre Herme in Paris or Mary just down the street. Luckily, they did have a small selection of fresh chocolate pieces that we could select from to make our own box. We chose a small box that could fit about 16 individual pieces of chocolate and then went to town looking at all the different chocolates and picking out the ones we wanted. Be forewarned though that all of the descriptions of the chocolates were in French, so trying to figure out what we wanted was just that much more difficult. There was a whole selection of what looked like miniature chocolate cones, each with a different filling inside. I had to take one of those, the one with the caramel and hazelnut filling. My husband was interested in the bon bons called “Manon” that came in both a coffee filling covered in dark chocolate, or an orange filling covered in white chocolate. We got one of each of those. There was the Aphrodite, which is vanilla and milk chocolate covered in white chocolate. Or some gorgeous bon bons with lavender-flavored filling called a Violetta. How about the “Divine” bon bon filled with luscious caramel? For those that love nuts, there’s the Passion Amandine with milk chocolate and almonds. A very cute, miniature cupcake-looking bonbon called a Pagoda that is filled with coffee-flavored ganache and milk chocolate. Neuhaus even had some alcohol-infused chocolate bon bons. We ended up selecting a couple of them so that my husband could give them a try. There was the Bourbon which was filled with vanilla cream mixed with bourbon. 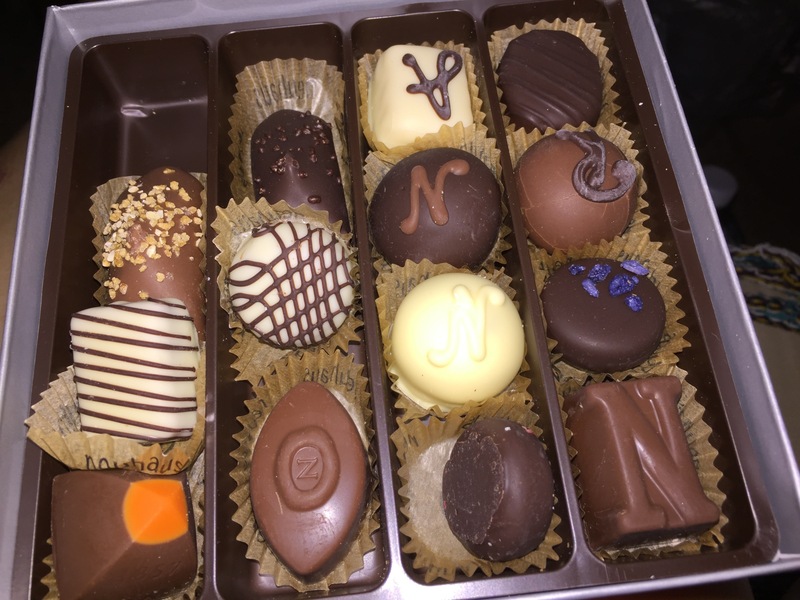 Of course, Neuhaus had to have their signature Bonbon 13 and I also so their Albert chocolate bon bon as well. There was a bon bon called the 1857 which is a praline made with speculoos. Now we had our own hand-picked box of bon bons to take home and enjoy. We chose flavors based upon what we liked rather than what Neuhaus was known for, so we didn’t have a Bonbon 13 in our collection. My husband tried the alcohol-infused chocolates first and he liked them. One bite and you can definitely taste the alcohol in the chocolate. With the rest of our chocolate box, we thought that the chocolates were tasty, but nothing stood out as being extraordinary compared to some of the other chocolate we had already sampled on this trip. On it’s own, Neuhaus is fantastic. Rich, flavorful, sweet chocolate bon bons and a wide selection of flavors to choose from. 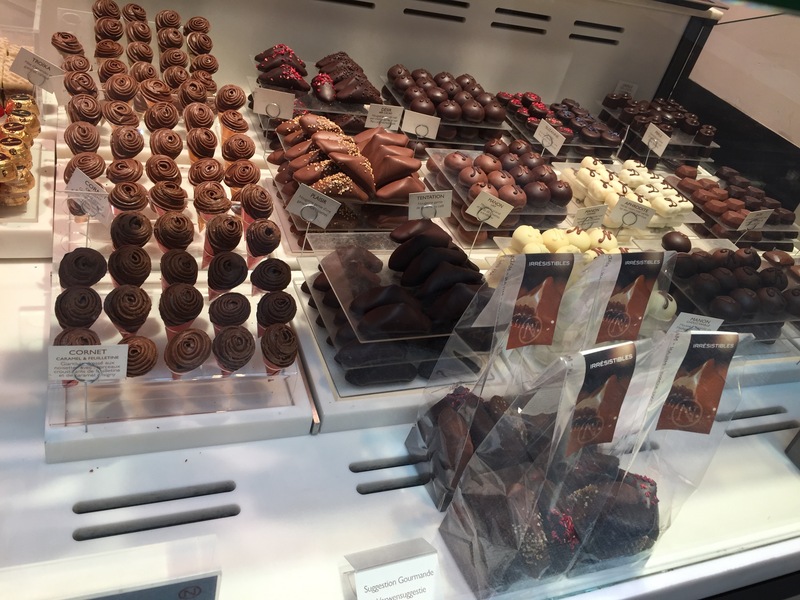 However, since our decision to go to Neuhaus was based upon it being named one of the top 10 chocolate shops not to be missed, we found it a little underwhelming. The quality of the chocolate bon bons that we sampled didn’t seem to have the appeal and creativity in flavor, texture and design that Pierre Herme or Mary Chocolatier had. 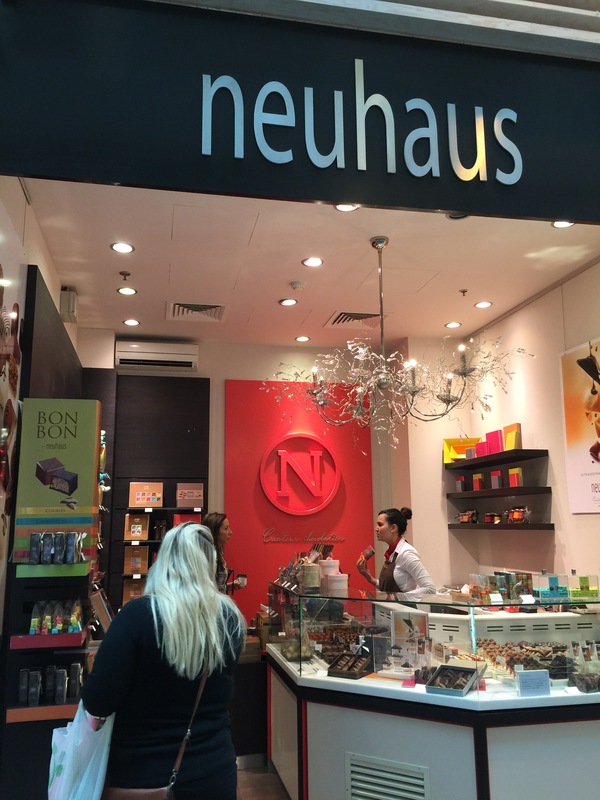 Yes, we went to a Neuhaus location which was smaller, and perhaps due to that fact the selection was more limited, but just from the chocolate pieces we chose, my husband and I didn’t find anything that really stood out to us and set Neuhaus apart from its competition. 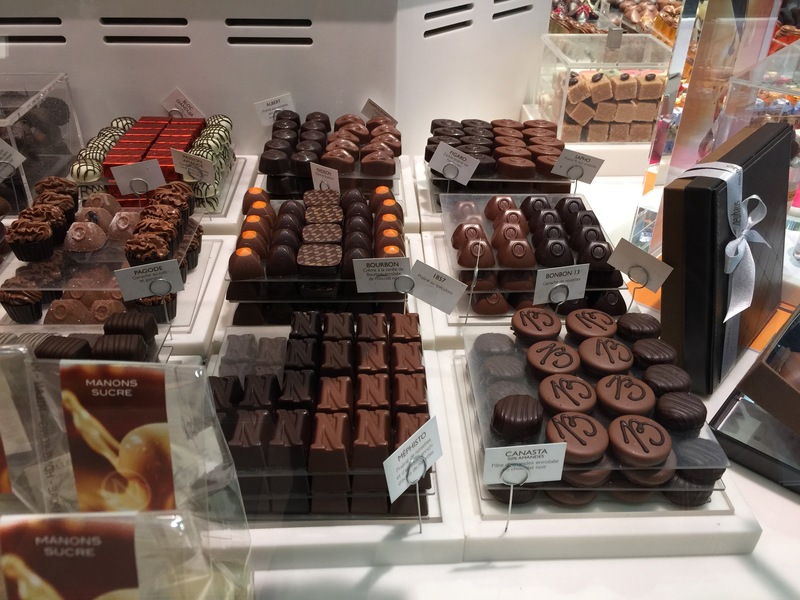 Sadly, while we have one more chocolate shop to sample on this trip, Neuhaus currently sits at the bottom of the list as far as chocolate we’ve tasted so far on this European vacation.